While in the middle of doing an SCCM 2007 to SCCM 2012 migration, my SCCM 2012 PXE Task Sequences would fail after the image had applied and the client was downloading and installing additional applications. First thing I did before the image failed was to press F8 to load up a command prompt, then type in CMTrace so I could view the logs easily. The log of interest was the cas.log which told me that the machine was unable to find any distribution points when locating the software. I knew the boundary was correct and that the boundary group was correct also. Anyway, I double checked the boundary groups in SCCM 2012 and noticed that the SCCM 2007 running migration jobs automatically created a boundary group for the SCCM 2007 distribution point and assigned the boundaries I was using to it. This caused my clients unable to locate software to download and install additional programs. I had migrated everything I needed from 2007 to 2012, so I simply stopped the 2007 migration job and deleted the automatically created 2007 boundary groups. I then reimaged the machine and the cas.log looked good and could find the distribution point it needed to download the additional software for the Task Sequence. This entry was posted in PXE and tagged PXE, SCCM 2007, SCCM 2012 on 07/06/2015 by nhogarth. I was facing an issue where every SCCM 2012 client at a certain site would not download Windows updates from the SUP on the SCCM 2012 server. First thing I checked was the C:\Windows\CCM\Logs\WUAHandler.log on the client. I found the incorrect setting in group policy and added the http:// to the link, did another “Software Updates Deployment Evaluation Cycle” on the client and all the updates started flowing through for all machines. This entry was posted in Software Updates and tagged Group Policy, SCCM 2012, Software Updates, SUP on 07/06/2015 by nhogarth. I have had a few issues with the WDS service not starting on some of my distribution points. 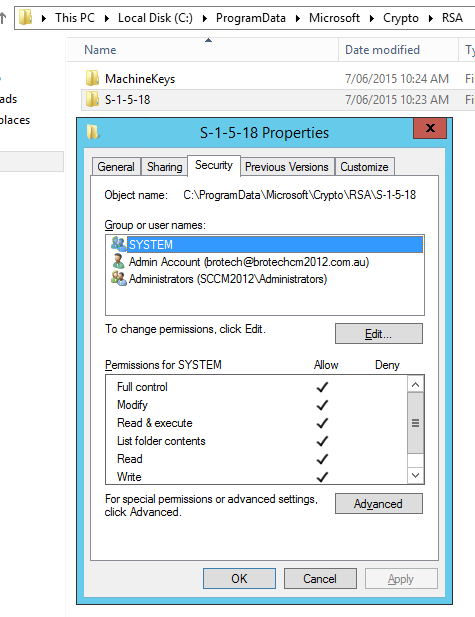 One server was easily fixed by checking and fixing the permissions for the SYSTEM account for the C:\ProgramData\Microsoft\Crypto\RSA\S-1-5-18 folder. It needed to have Full Permissions to start. For some reason the permission was removed which caused the service to fail each time I started to fix it. Another time I had this issue, it turned out to be a corrupt SQL computer account in the SCCM SQL database. I removed the login for ComputerAccount$ from the SQL Management Studio and re-created it with the same permissions and the WDS service can now start. This entry was posted in WDS and tagged PXE, WDS on 07/06/2015 by nhogarth. PXE issue – There are no task sequences available to this computer.. Please ensure you have at least one task sequence advertised to this computer. Disclaimer: This is what worked in my environment. It may not work in yours. Run at your own risk. I am not responsible for any issues it may cause. Modifying the database is not supported by Microsoft. This was a strange issue which caused me a massive headache. I was unable to successfully PXE image any machine at my site. When trying to image, it would get the abortpxe message and not pick up the advertised Task Sequence. In my environment, I do not have Unknown Computer support enabled. I have a collection and task sequences deployed to the collection as Required. I could not clear the PXE flag on the machine in SCCM 2012 because the machine had not run the advertisement. I confirmed the machines had a task sequence deployed to it. I tried different computers with different MAC addresses but it was the same issue. There are no task sequences available to this computer.. Please ensure you have at least one task sequence advertised to this computer. After this was removed, I restarted my Management Point I could now image again. What a lifesaver this script was! This entry was posted in PXE and tagged PXE on 07/06/2015 by nhogarth.